Grooming is an essential part of any horse owner’s daily routine and it has many great benefits for both horse and rider. Regular grooming removes gross mud, dirt and dust from the mane, tail and coat while stimulating the hair follicles to produce more natural sebum, resulting in a smoother, glossier coat. Alongside the aesthetic benefits, grooming is actually a vital part of getting to know your horse. In herds, grooming is done between field mates that trust and respect one another, and these tactile creatures act the same way with their owners. By spending time cleaning and grooming your horse while maintaining plenty of eye contact and adopting a soft, gentle tone to your voice, you will reassure him and deepen your bond. So what do we need to groom? There are hundreds of weird and wonderful contraptions and devices out there, but we have narrowed it down to a handful of five must have items to compile the ultimate grooming supplies checklist. Starting from the top, any horse that has been turned out will require the use of a dandy brush to remove gross mud, clay, hair or all the above. It is vital to find a good quality brush with the natural stiff bristles that will remove mud and dirt without scratching the skin surface or damaging the hair follicles. Dandy brushes should never be used on the face or around sensitive areas such as the fetlocks, inner hindquarters or lower abdomen as the bristles are too abrasive for these delicate skin layers. This large brush is much softer than its dandy counterpart, and has a far larger surface area also. The shorter, soft bristles are designed to wick away micro dust from the coat and stimulate the follicles to release sebum, resulting in a healthy shine that highlights great conformation. Held in the hand, this brush should be used in long sweeping strokes following the horse’s contours and coat direction. These combs are for use alongside the body brush, but are never to be used on the horse’s body. 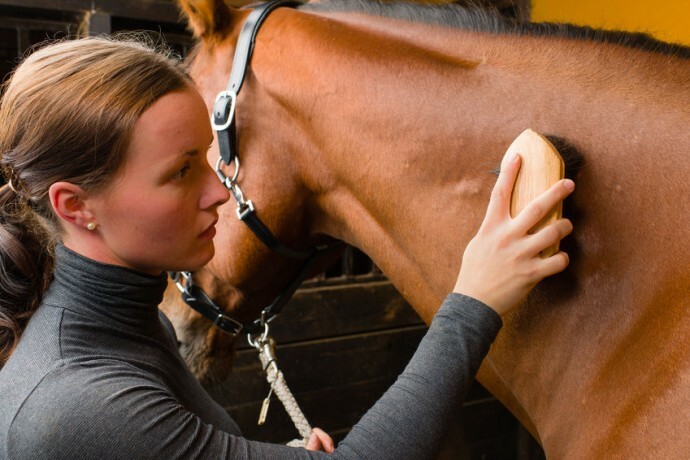 The metal comb is designed to remove the loose hairs and dust from the body brush during grooming, so you would brush the horse 3 or 4 strokes, then drag the body brush along the curry comb to remove the hairs and dust and prevent simply moving them around the horse’s body. Unless your horse is hogged, even the shortest forelock, mane or tail will require a comb at some point or another, and by keeping on top of this daily you will avoid the inevitable dreadlocks that accompany the winter months. Use a wide toothed mane comb and some mane and tail detangle spray to gently tease knots out and keep your equine friends hair sleek, tangle free and in tip top condition. This is perhaps one of the most important tools in your grooming kit as the health of your horse’s feet dramatically affects your horse’s well being. A lodged stone or impacted mud or droppings can cause bruising and injury to the delicate frog and sole of the hoof, therefore it is vital that your horse’s feet are picked out at least once a day working from heel to toe.